After the scandalous Tezwa affair, the resignation of the President forces an election, with the future of the United Federation of Planets at stake. But the fate of the entire galaxy hangs in the balance when the Federation embassy on Qo'noS is seized by terrorists, whose actions expose an intrigue which reaches the highest echelons of the Klingon government. 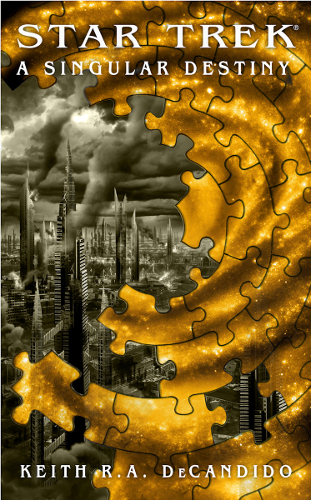 The final book in the 'A Time To' series has surpassed my expectations, much as the previous two. I felt the series started rather weakly, but towards the it's conclusion it has grown into something stronger. While there is not really a central adventure to this novel, it's story is still captivating, as it focusses on not only the Enterprise crew as they prepare to separate, but also an inspection of their vessel, a hunt for a missing emperor, and a presidential election. 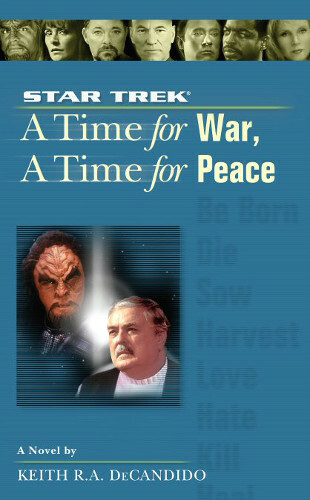 In fact, I think this is better described as the first of the Star Trek political thrillers, as it's focus on the election and Worf's diplomacy take up a significant proportion of the narrative. The main aim of this novel of course is to wrap up the series and to move the playing pieces into position for the film Nemesis, and it does this excellently. Previously this has seemed rather forced but DeCandido makes everything flow naturally and sets up even minor details in a believable manner. I was pleased with the use of characters, though the focus away from the Enterprise meant some had less 'screen-time' than they perhaps deserved, particularly Crusher and Troi. Scotty's presence also seemed a little bit surplus to requirement, and I think a different character could have played his role equally well. There was some rather unnecessary wrangling at the end that doesn't quite seem to fit in with how the later books progress, but as it was written first I don't suppose I can criticise on that basis. 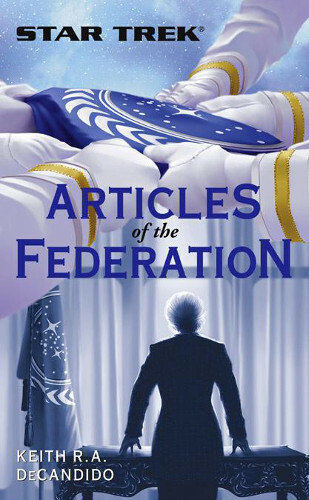 I very much enjoyed this book and am looking forward to rounding the series off with its one-off sequel 'Articles of the Federation' which is the true first of the political novels.